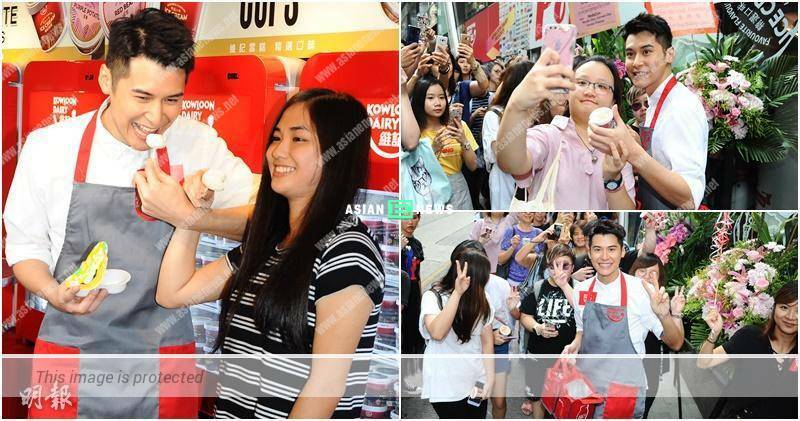 Carlos Chan (陳家樂) acted as a shop manager for a milk brand at the Central on 12th July 2018. Other than feeding his fans with mochi ice-cream, he also distributed ice-cream outside of the shop which attracted supports from a big group of his fans. When mentioned about the increase in his workload and attending activities lately, Carlos thanked the clients and suffered from insomnia due to the stress: “I am suffering from hormone imbalance and perhaps it is due to filming series, promotion campaigns and other activities. I cannot sleep despite feeling exhausted. House of the Rising Sons (兄弟班) film is going to air soon and hope the box office will be a success. Thus, I keep thinking about the ways to promote the movie. (Suffer from insomnia due to your ended relationship too?) Nope. It is pointless to think about an ended romance.” He added he was not ready for a new relationship right now.